Ely Wildspace volunteers spent last Saturday morning installing two purpose-built tern rafts on Roswell Pits. Common terns arrive each spring from Africa to feed in the Roswell area, but seem to breed several miles upstream. By providing them with suitable habitat we hope these artificial islands will boost the population of these fantastic birds by enabling them to nest in Ely as well. 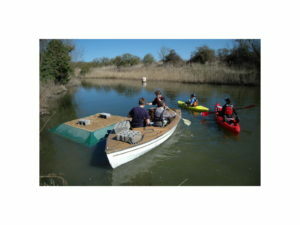 The rafts were made for us by local company K and K Mouldings, and funded through an extremely generous grant from the Clark Bradbury Charitable Trust. Many thanks to everyone who gave up their time to help with the launch, as well to the Environment Agency for logistical support. Amazingly,the first two terns we’ve seen at Roswell this year arrived as we were towing the rafts out into the Pits. Fingers crossed that they take a liking to the bespoke accommodation now available and begin nesting in the next few weeks. Are you up to the challenge of finding 80 or more bird species in a single morning on the edge of Ely – or do you simply want a guided birdwatching walk around the fantastic wildlife areas right on our doorstep? Either way, join the Ely Wildspace Bird Race on Sunday 19 May 2013. We are meeting at 6 am sharp at the top of Kiln Lane, where we will divide up into small teams, each led by an experienced local birdwatcher, to walk around the Wildspace trying to see and hear as many bird species as possible. At around 11am the teams will meet up to compare notes and discover the winners! The event is free and everyone is welcome. Please bring binoculars (if you have them), warm and waterproof clothing, and plenty of food and drink. To celebrate International Dawn Chorus Day, Ely Wildspace are holding a Dawn Chorus Walk on Saturday 4 May 2013 at Roswell Pits. Come along and listen to the wonderful symphony of song as the birds of Roswell awake. No experience is necessary as expert Tony Fulford will be on hand to help identify the songsters. Bring a pair of binoculars if you have them and meet us at 5am at the top of Kiln Lane (by the Environment Agency car park, off Prickwillow Road).